NBC 5 and Medical City Healthcare are encouraging healthier eating habits at snack time and invite you and your company to join in the 21-Day Challenge @ Work Snacking For Success! The deadline to register your company is Friday, August 31! The challenge takes place October 1st – 21st! The challenge is to eat a healthful snack that includes a serving of fruit or vegetables for 21-consecutive days. 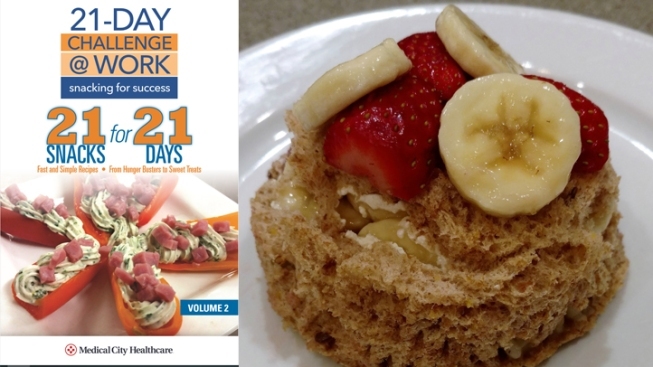 Using the 21-Snacks for 21-Days recipe book or our easy online Healthy Snack Finder, challengers will discover hundreds of creative and delicious recipes created by high school culinary students. Support over 300,000 elementary school students across 14 school districts, who will be encouraged to take the “kids teaching kids 21-Day Challenge” through Medical City Children’s Hospital by hosting the Snacking for Success, 21-Day Challenge @ Work for your employees. Last year’s Fall 2017 campaign proved successful with over 2,600 employees from 14 different companies and organizations simultaneously participating in the challenge. Instructional Video to help guide participants through the challenge. Data Analysis Report summarizing participants’ results, showing the positive impacts on employee performance. Please register your company for the 21-Day Challenge @ Work by visiting www.SnackingForSuccess.com/registeryourcompany. Deadline is August 31! A Registered Dietitian will contact you within 24 hours to help you. Recipe books will be shipped to you the week of September 17th! Take the challenge October 1st – October 21st! Take The Final Assessment! Two weeks after the challenge has ended, you will receive a link to take the 2-minute assessment November 5th – November 12th!